Doran 4300M Digital Weighing Indicator features stainless steel construction and check weighing lights to allow you to easily see if your items are within the target range or if they are under or over. This meter could be placed on bench scale platforms or industrial floor scales. 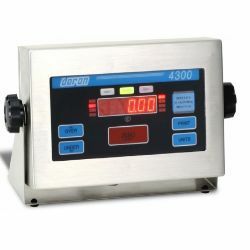 We also offer this indicator as a complete 4300 checkweigher system as well. Simple to use with minimal operator training. Set over/under tolerances right from the front panel using the Up/Down arrow buttons. Checkweigh to zero or actual weight with 3 or 5 zone checkweighing operations.